"So which Nights are they, the Arabian or the Thousand and One? ... The dual title neatly illustrates the hybrid nature of the work: it is part of Arabic and European literature it contains stories and motifs that may be traced to Sanskrit, Persian and Greek literature, it hovers between the oral and the written the popular and the highbrow, the pious and the scabrous, realism and fantasy. 'Arabian' an epithet it acquired in Europe is a misnomer, for it was neither conceived nor written in Arabia and the great majority of the stories are set in Iraq, Egypt or Persia, rather than the Arabian Peninsula. The original Arabic title Alf layla wa-layla translates as 'A Thousand and One Nights' -- but one should be cautious using the term 'original' for the earliest mention in Arabic refers to a Persian book called Hazar afsana, 'A Thousand Tales.' An Arabic version including the frame story about the resourceful and eloquent Shahrazad and the murderous misogynist King Shahriyar (a story that may be of Indian origin whereas the names are Persian) was around in the tenth century but the text is not preserved presumably because it was deemed to be 'silly stuff' in the words of a tenth-century scholar. It was anonymous its language was not sufficiently polished and it was too obviously fictional and fantastic in parts all of which precluded its acceptance in highbrow circles. At the same time it was never as truly popular in the sense of widespread among and beloved by the illiterate as the monstrously lengthy and equally anonymous epic tales such as Sirat Antar or Sirat Bani Hilal. "Then in Europe three centuries ago the Nights rose to the pinnacle of critical esteem when Antoine Galland produced his French translation which spawned numerous other European versions. The Nights came to belong to World Literature, loved by children, novelists, poets and the general reading public, in the process contributing much to the formation and malformation of the Middle East in Western eyes. Galland did more than merely translate, he shaped the text into what became a more or less canonical form, as a result The Nights are as much a part of Western literature as of Arabic. To Western readers the stories of Aladdin, Ali Baba and Sindbad belong to the core of The Nights and are among the best-known tales, but they did not belong to the Arabic text until Galland added them. 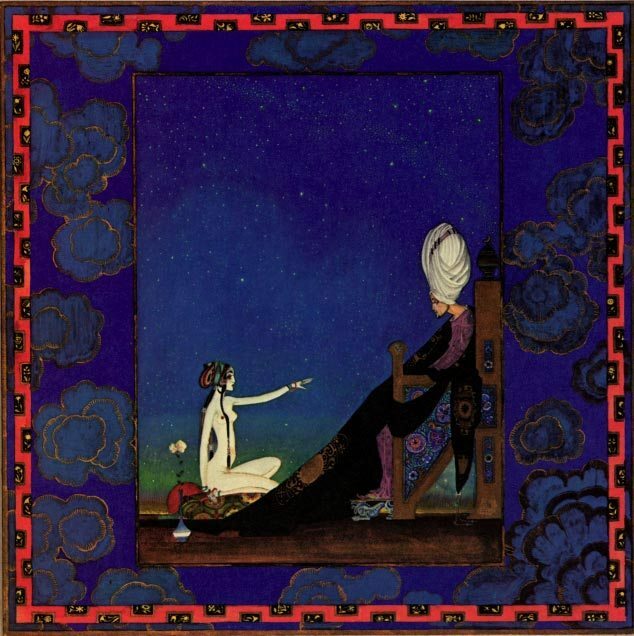 There is in fact no known Arabic text of the Aladdin and Ali Baba stories that predates Galland and elements in the story of Aladdin suggest that it may have been a European fairy tale rather than an Arabic one. ... It was only in the course of the twentieth century that the Arabs themselves in the wake of the Westerners came to consider the Nights as something to be proud of and to study seriously instead of enjoying it in secret as a guilty pleasure. Many reactionary Muslims still consider it an unedifying text that ought to be banned or at least expurgated, but on the alwaraq.com website where a wealth of Arabic texts may be consulted and searched The Nights have the highest number of hits (I should add that the Koran is not listed there)."